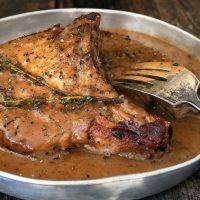 Beautiful thick bone-in pork chops, served with a flavourful peppercorn sauce. Heat olive oil and butter in an oven-proof or cast-iron skillet over medium-high heat. Pat dry pork chops and season with salt and pepper. Scatter flour on plate and dredge pork chops lightly on both sides. Sear chops in hot skillet until lightly golden on both sides. Pop the skillet with pork chops into preheated oven and cook until pork reaches 135F, about 10-12 minutes (depending on thickness of chops). Note that this is a little undercooked because it will cook a bit further on the stove-top and a bit more as it rests, so it will get to the recommended 145F in the end. Remove from oven and place over medium-high heat on the stove-top. Quickly brown the chops on the stove-top, then remove to a plate to rest. To the hot skillet, add 1 Tbsp butter, onions and peppercorns and stir until onions are golden, about 1 minute. Add wine and cook, stirring until mostly evaporated, about 1 minute. Add broth and thyme sprigs. Reduce heat to medium and allow sauce to simmer/reduce for a few minutes. Add cream and then salt and pepper, to taste. To thicken gravy, combine cornstarch and water in a small bowl, stirring until smooth. Add a bit at a time to your hot gravy, stirring, until desired thickness is achieved. Spoon hot sauce over pork chops. Finish with a generous grind of freshly ground pepper. Brining pork chops is a great way to improve the finished texture of your chops. See the Cook's Notes on this recipes blog post for complete instructions on how to brine pork chops!